Magnolia Gardens, Harris County, Texas. Texas | Columns | "Wandering"
Before he became world famous Elvis Presley hip-hopped all over the map of Texas, and he made many a return trip to Magnolia Gardens on the banks of San Jacinto River in eastern Harris County. Floyd Tillman, George Jones and Tommy Sands also entertained there along with numerous other big names and biggies-to-be in country and rock. Tillman even recorded a song, �The Magnolia Gardens Waltz,� in which he laments a lost love. While not as well known as most songs by the Country Music Hall of Famer, it�s still worth a listen. Young folks today respond with blank looks when you ask if they know anything about the place. Really, it�s not a fair question, because this haven of riverside rockabilly reached its peak of popularity in the Fifties. Although that�s my era and I grew up in Baytown, I have a gap in my recreational history. I never went to Magnolia Gardens. I regret that and especially hate having missed the opportunity to see Elvis. I asked Norman Adams, who grew up in Highlands and graduated from Baytown's Robert E. Lee High School in 1953, if he remembered Magnolia Gardens. Located off Highway 90 and meandering around a bend in San Jacinto River, the park was an easy commute from Highlands, Crosby, Channelview and Sheldon. Beckoned by a wide beach, swimmers enjoyed access to the river, and the park had facilities for boating, fishing and volleyball. Even with those varied recreational facilities, though, music remained the main attraction at Magnolia Gardens. 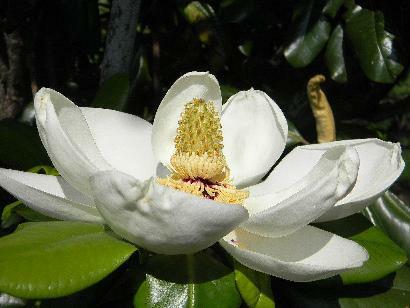 Besides talking to Norman, I searched Magnolia Gardens on the Internet and found a lot out there, including videos of Elvis singing plus stories and photos about the park. Country singer Johnny Bush, in his autobiography, remembered Magnolia Gardens as the place to go on a Sunday afternoon. He said people would sit around in their bathing suits on a sandy beach and take in shows by all the biggest country and early rock �n� roll stars. By the way, I read that Elvis claimed Magnolia Gardens was one of his favorite places to perform. Dang, I wish I'd been there.